Because all story characters must be original creations, Liadan, age 7, creates Bob Pedusky, a one-eyed monster resembling Mike Wazowski but with different physical and personality traits. If you were to have passed 5125 Penn Avenue any afternoon this week, you would have heard the sound of joyful giggles, enthusiastic discussions, and constant references to polaphanticorns (a polar bear-elephant-unicorn species) and Monsters Inc. protagonist Mike Wazowski. In short, you would have seen the Storytellers’ Studio Camp in the making. A week-long summer camp, the Storytellers’ Studio Camp is one of the many programs offered by the Literary Arts Boom (LAB) as part of a summer-long celebration of connected learning coordinated by Hive Pittsburgh. The mission of the camp is to excite kids about storytelling through various mediums, from play production to songwriting to cartooning. The program is divided into three separate camps target to a specific age group: the week of July 8th is for ages 5 -7, the week of July 15th is for ages 8-10, and the week of July 22nd is for ages 11-13. As with all of the LAB’s programs, the emphasis is on helping kids “pursue their interests, find their voices, and have fun,” explains LAB founder and director Paula Levin. The Storytellers’ Studio Camp provides just that. From 3 to 6 pm Monday through Friday, kids get to delve into the dynamics of storytelling, infusing lessons of narrative structure and characterization with creativity. Educators and outside partners come to the camp to guide students throughout the week, but ultimately, the story and its various finalized forms are all a product of the kids’ own ingenuity and collaboration. “It’s about tapping into the energy of the kids and channeling their passion into a cohesive story,” states Juan Fernandez, a cartoonist who serves as one of the camp mentors. 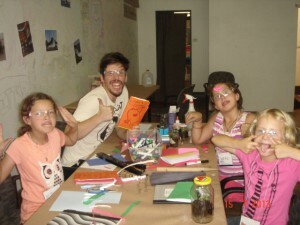 (from top right, moving clockwise) Abby, Liadan, and Neila don their safety goggles as they begin to work in their personal storytelling notebooks with the help of their mentor Juan. LAB has done it again. 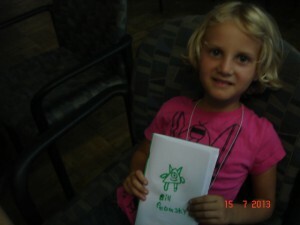 They provided a program to my girls that was not only fun but enriching. My favorite thing about the LAB programs is how they manage to bring out so much creativity in my kids while still keeping a fun structure and a learning environment. One of the heat examples I can give is hearing them telling me about the Mad Lib Hopscotch game!